The workbook is over 200 pages long and colorful and fun. There are things like puzzles and games in it. Things will suit parents and children of all pages. I received the physical copies of the books though they do have a good deal for the PDF versions. How we used: We worked on this each day. Starting with reading the Bible passage. Then we would spend the rest of the week reading over the passages and going over the questions in the study guide. We would also do the activities that went along with it. You will need your own Bible for this as sometimes you have to look things up in your Bible as they are not in the book. There is copy work which helped with learning and remembering the memory versus. These are age appropriate. There is one for younger kids and one for the older kids. We did not always follow the days like planned. Sometimes we spent more time on things than others. There are helpful icons that tell you what part you are going over. It starts with The Seed, which is where the topic is presented. Then it moves on to Planting the Seed, which gives the memory versus. All my kids are young so we just did the simple one. Then you have the Watering the Seedling, which is a narrative that I read out loud to everyone. This allowed us all to focus on the story. There are other parts for older children to do as well like Digging Deeper which is just that, you are going more in depth with the topic you are learning. I think this would be good to keep around and do again as they get older and more understanding. 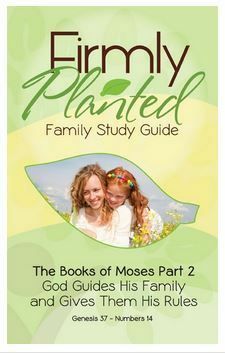 I think this lesson set would be great for any Christian family looking to dive into a study together for the family. I like that it includes every one and the workbook even provides the different levels as well. I think everything about it was great, I think there should be a bit more flexibility in the plans that it has on what to do each day. Smaller kids may do it slower and the older kids quicker. We spent more time on things like cooking or the craft as well. Be sure to check out what my other crew members thought as well and the other products by Real Life Press.